Other information: He needs to be an only cat. He lost an ear as a stray due to frostbite. Tommy is a handsome and social fellow rescued by a Community Cat team volunteer who saw the potential in the big stray tom she started feeding when he turned up near her home. After gaining his trust, she was able to get him into a carrier so he could be neutered and he turned out to be quite the lovable guy. 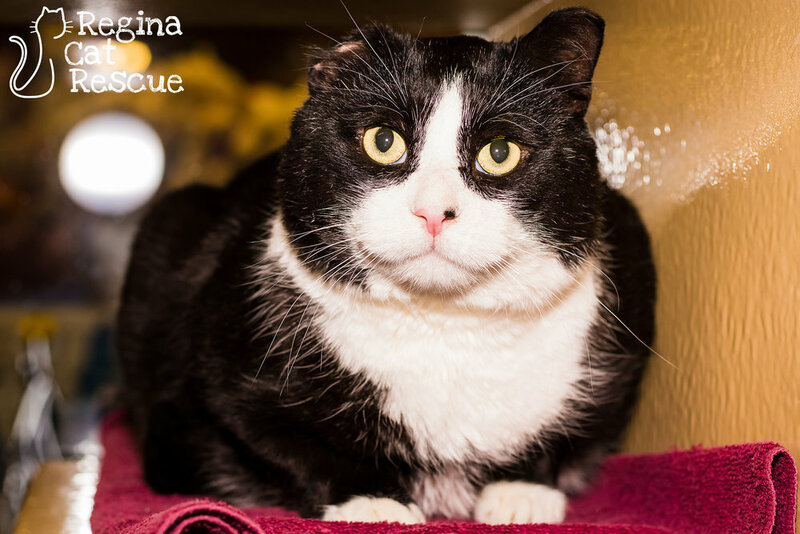 Tommy is a big cuddly bear of a cat who bears the scars of his days on the street. He lost an ear, and he is wired to protect his turf so he does not get along with other cats. However, he does love people and attention. He is easygoing enough to tolerate being dressed up in wigs and hats to hide his damaged ear, and he definitely likes his share of pets and cuddles. Tommy is a cat that had a rough start and he can be a little rough around the edges, but his ability to love and his natural charm make him hard to resist. He is a character that will provide a lot of love and entertainment to his person, and it is an absolute pleasure to have him in our care. We await the lucky adopter who will claim Tommy and make him their own.